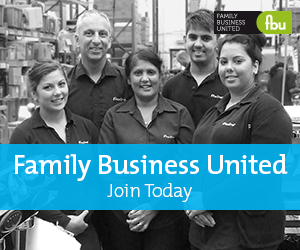 Family Business United ('FBU') has launched a new campaign to celebrate the depth and diversity of family firms across the UK. Join our #FamilyBusinessBritain campaign today. FBU has launched this latest campaign to generate further recognition of the contribution that family businesses make to the UK economy. The plan is to collect over 2,000 images from family firms the length and breadth of the UK and to collate them into one beautiful 'billboard size' artwork. The artwork will showcase family firms and help to raise the profile of family firms and what they do across the country on a daily basis. Free to take part in, family firms are being encouraged to send in high resolution landscape images which will then be incorporated into the piece. Images should include products, vehicles with logo's and family/staff members wherever possible and should be sent to paul@familybusinessunited.co.uk. The campaign can be followed on social media using the hashtag #FamilyBusinessBritain which is being undertaken with Barnwell Print, the oldest family owned printers in the UK today. Paul Andrews, founder and Managing Director of FBU added, "This is our latest innovative campaign to showcase family firms, something that we do each and every day. Family businesses are the engine room of the UK economy and make a fantastic contribution in terms of income, jobs and wealth creation and given the current uncertain economic climate we hope that this will help shed a really positive light on the family business sector. The artwork being produced will be shared and shown around the country in due course and will really help demonstrate that family firms really do help make Britain great." "We look forward to receiving hundreds of images and collating them into something really special."